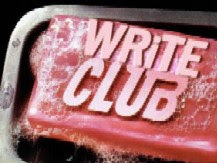 This is the second to last skirmish where I pit anonymous writing samples of contestants not lucky enough to be chosen for WRiTE CLUB 2012, against one another despite the absence of prizes, or further advancement beyond this one bout. As I've stated before, there is still plenty to be gained…and learned from all of you. This week it's Vern A Culara's turn in the ring. Here is their 496 word submission. Not just a contest, but a chance to step into the literary ring of challenge and lay out the competition. It can’t get any better than facing off against a fellow writer, and then another, and another until you stand on top of a heap of fallen hacks. This is my chance to show everyone that I deserve to be published. My hands hover above the keyboard, fingers twitching in nervous anticipation. All I need now is the inspiration that will send my digits flying. Fantasy. Science-Fiction. Comedy. All genres lay open before me, I need only pick one of them and begin the great journey of conquest. Any style will fit within the parameters of the word-wielding slugfest. I just need one idea and I’m writing my way to the next heavy-weight championship. I lean back in my chair and command my mind to create. While I do that my eyes drift towards the window and the view beyond. The lawn needs to be mown. I bet Steven King doesn’t have to do his own yard work. Probably best that he doesn’t since I can imagine all sorts of ill fated events that could arise from allowing the master of horror to wield implements of botanical destruction. My mind snaps back to the task of finding an idea worthy of authorial dominance. It has to be under five hundred words. That leaves out fantasy; you can’t even properly introduce a character in that short a space. I mean, who wants to read a tiny tale about a master wizard that blows himself up because he adds the wrong component to his cauldron while arguing with his wife? The same problem exists for Science-Fiction. You need at least a thousand words to describe how warp drive technology would create a schism in the brains of anyone traveling through multiple dimensions. How lame would that be if I merely described what transpired between the pilots’s split perceptions during the warp and how it changed him when they all combined at the end of the trip. How pathetically unspectacular. Comedy? Of course, comedy. It works perfectly in a short format. You could write about practically anything as long as you put a humorous spin on it. Take a couple lines of dialogue and add my own unique perspective to it. BOOM! Hilarity ensues. Great! How am I ever going to come up with an idea for a story if people keep distracting me? I pull a five from my pocket and hand it to the oldest of the urchins and then shoo them out the door. When I sit back down in my plush writing chair, my mind is blank. For more than an hour my muse avoids me. Eventually, I put my head down on the desktop and admit defeat. And in the other corner, checking in with 499 words, is Silver Lightning. Frank Einstein jumped back as vials and flasks smashed on the floor. The contents snaked around, hissing and creating acidic puddles. “Not again! Dr. Jake, control your blasted fungi.” Being apprenticed to the greatest scientist in the universe wasn’t easy. The constant hum of power aged Frank beyond his years and the charged atmosphere caused premature balding. The young apprentice heard the trademark swishing of the long coat of his mentor. “No, of course not,” Frank replied, miffed because the pylons were his first individual project. One of Frank’s experimental pylons keeled over and the blue crystal smashed against the floor as the ground began shaking uncontrollably. If the intruders were coming in such a large number, it was not for a peaceful negotiation. “Head into the storage chamber. We must escape before they get here,” Frank cried out. The whole cavern was beginning to twist and warp. How many of them are coming? But his thoughts were cut short by a small chunk of rock falling from the ceiling in front of his feet. Frank cursed and dashed towards the small chamber filled with their previous experiments and records. It also housed one of Dr. Jake’s old teleporters. Frank hurried to remove the covers off the teleporter. A film of dust had accumulated over the glass vestibule but it appeared functional. Lights sparked and the machine purred to life as he flicked the switch. His mentor threw cartons around, rummaging through piles of boxes. The explosions became louder. “Dr. Jake, we must leave. Now!” Frank shouted. They had less than a couple of minutes. The old scientist emerged from behind a high pile of boxes, looking woozy. His brown coat was completely covered in gray cave dust as was his hair and face. See you back here at the ring for one last bout next week! Probably the second one is more engaging with the two men. Trust me, you don't need that many words to describe a warp drive! Even less to describe teleportation. Really split on this one. Hmmmm ... Can't really decide between the two, since neither is particularly pulling at me. They're both written well, just not my tastes. Yeah, I'm kind of split on these two, also. The first one was cute, but kind of rambled. I did like the ice cream line, though. I had to read the second one twice to even figure out what was happening. It could stand to use a little more action and a little less "shouted," "cried out," and "exclaimed." The story has possibilities, though. This is hard because they're so different. The first is a little slow and didn't engage me until that bit about the children bursting in asking for money to buy bullets. How funny that the unnamed narrator doesn't realize he has an intriguing story happening in his own family. I give you points for cleverness there, Vern. The second was more exciting and drew me in more, but there are some confusing bits. At one point, "the apprentice" speaks immediately after Frank -- but aren't they the same person? And when Frank grabs his mentor by the shoulders and then a chunk of rock falls at his feet, I was trying to picture where Dr. Jake was at that moment. Wouldn't he have been hit by the rock? Also, I agree with Stacy that you don't need all those dialogue tags. Gives it a breathless quality. If this were Write Club, I'd have trouble deciding between these two. Would probably go with Silver Lightning. I'll go with the second one. It drew me in more. I'll admit neither did anything for me. The first one is the better one writing wise. I just wish it wasn't talking about writing a story. That didn't pull me into the story at all, even if I can relate. With the second one, I just couldn't connect with the main character. I can't decide. I enjoyed them both. The first one was fun, light and breezy and true to life! But I liked the second one, too; it made me want to know what would happen next. I liked #1. The only issue I had is the change of POV from I to you and back to I. So, I'm going with #1. We've all lived the first story. I think non-writing readers would have found it funny, but as a writer it just felt like any random day in my life - LOL. I joked the other day that I worried that by the time my kids leave for college I'll be so used to writing amid chaos that I won't know how to function in the silence. What's truly funny about the piece is my suspicion that that is EXACTLY what happened when Vern tried to write something to submit. I think the second piece had a little too much crammed in - developing the characters, experiments, shifting planets, The Essence, and the invaders. It probably works better in a longer piece, but perhaps the writer would have achieved more by not trying to introduce the reader to so much in only 500 words. Neither had a major flaws that would have cost them my vote. Good job! The first one was a good laugh and I liked the stream-of-consciousness aspect. But my vote would go to the second one, being more of a "story" and it did draw me in more. Some intriguing elements that could be explored more. Number 2 was intriguing but (like number 1 pointed out) sometimes Sci-fi excerpts can get bogged down with explaining technical details at the expense of developing a connection with the characters. I think this passage (as a book beginning or a contest entry) would be improved if you took a little more time to nail down the quirkiness of the characters and their relationship. You hear a lot of people say "begin the book with action" with the presumption that this is going to hook a reader, but it's not a magic cure for a weak beginning. It may improve a slow beginning but if it still lacks a character or narrator that we want to follow, then it will still be weak. I agree with Joanne Fritz--It was hard to figure out who was speaking, but I feel with a little tweaking and a little more time devoted to showing us the unique, and complex personalities of the characters, this story would be improved and could be quite good. Because of sheer potential I'll give it my vote. I think I prefer the second one!